A plein-air painter known for her colorful townscapes, street scenes and genre depictions of Provincetown, and Truro, Massachusetts, Nancy Maybin Ferguson studied with academic realists Charles Hawthorne and William Merritt Chase at the Pennsylvania Academy of the Fine Arts, Philadelphia, in 1902-1903 and 1907-1912. By the 1920s, Ferguson had gravitated toward the fauvist-inspired work of Arthur Carles and other modernists active at the Academy. Ferguson won fellowships from the Academy in 1909 and 1929, and prizes in 1911 and 1916. 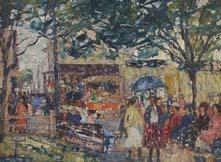 She was an active member of the Philadelphia Ten, a group of women artists who exhibited through World War II. Her work was included in a 1998 exhibition, The Philadelphia Ten: A Women's Artist Group 1917-1945, at the Westmoreland Museum of American Art, Greensburg, Pennsylvania. A book of the same title by Page Talbott and Patricia Tanis Sydney, with an essay on each artist, was written for the exhibition which traveled to Pittsburgh, Pennsylvania; Fort Lauderdale, Florida; Albany, Texas; Concord, Massachusetts; and Doylestown, Pennsylvania. Nancy Maybin Ferguson exhibited at the Art Institute of Chicago, Illinois; National Academy of Design, New York City; Buffalo Fine Arts Museum, New York; and Philadelphia Men's Club, where she received a gold medal. She also exhibited her paintings from 1914 through 1945 at the Corcoran Gallery of Art, Washington, D.C.; and in 1949 at the Pennsylvania Academy of the Fine Arts, Philadelphia.